"(...) And if it breaks down our body, there is only water and a few dozen small clusters of elements that you swim in it. The water rises within us like in the trees and shape the bodies of animals as a form clouds. (...)"
The German homeopathic physician Dr. Wilhelm Heinrich Sch�ssler (1821 - 1898) identifies twelve inorganic substances in 1873 - twelve tissue salts or minerals - which subsequently called "functional preparations", since each of them would be able to exert influence on the various specific functions d'orage (Hom�opatische Allgemeine Zeitung). 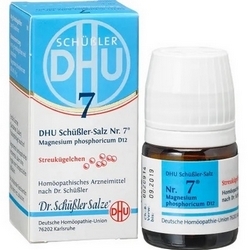 These twelve functional minerals - those precisely Sch�ssler salts - are a formidable scientific intuition and can be regarded as a link between oligotherapy catalytic and homeopathy, as conceptually based on the principles of cellular biochemistry (oligotherapy) and techniques of preparation and mode of administration of homeopathic remedies. From knowledge of his time, Sch�ssler identified these twelve minerals: 1.Calcium fluoratum, 2.Calcium phosphoricum, 3.Ferrum phosphoricum, 4.Kalium chloratum, 5.Kalium phosphoricum, 6.Kalium sulfuricum, 7.Magnesium Phosphoricum (seven rushing), 8.Natrium chloratum, 9.Natrium phosphoricum, 10.Natrium sulfuricum, 11.Silicea and 12.Calcium sulfuricum. Later, in reality, Sch�ssler removed from his therapy twelfth preparation, Calcium sulfuricum, so that his repertoire was reduced to eleven functional preparations. His successors restore this preparation which is still considered an important remedy biochemist.